The Haultain Common is undergoing a transformation: From a Common for people to a playground for pollinators. Gone are the goji berry bushes, to make way for lower-maintenance bee-pleasing plants. Into the void, “weeds” have grown magnificently and are currently providing a source of nectar for a variety of bees. (As an aside, how did “weeds” get such a bad name anyway?!) Soon, a list of native and non-native plants will be selected, ones that will be appropriate for the site. The goal is to provide a succession of bloom throughout the growing season. Theories of legal pluralism say that law flows in many forms, from many sources. If we think of law broadly, as rules with sanctions attached, we can begin to see diverse laws rising and falling everywhere: rules made by parents for their kids; rules made by bosses in their offices; rules made in churches for the faithful; rules made by governments for their citizens; social norms sown on the street. Let’s be mindful of all the legal greenery we can tend. Some of it blooms, some bites. Some of it stems from social locations easier to reach than others. Margot and Rainey co-founded the Common. They took a good idea, and propagated it. That’s a seed for social change: a good idea. Next, the seed should be planted in plain view. To be seen to be a good idea, the good idea must be seen. 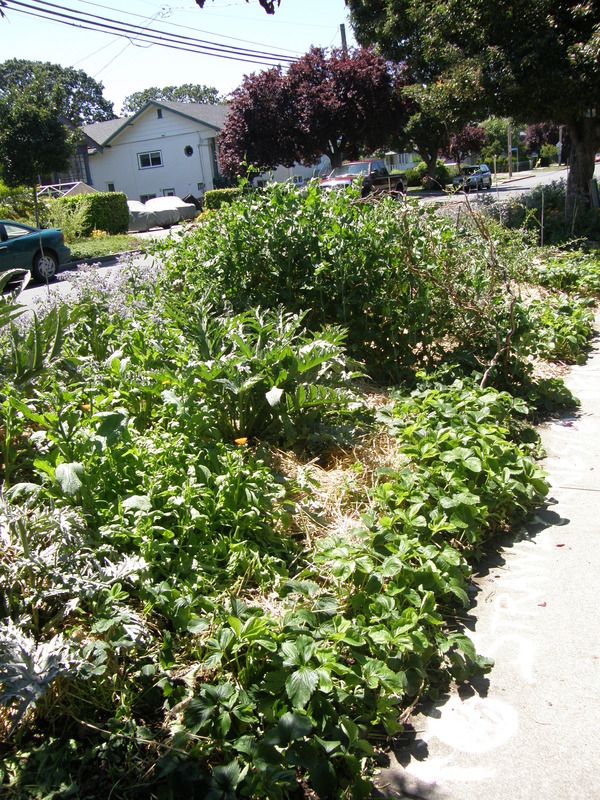 Street-side is a good place for gardening, a visible place, even if taking that step risked treading on flawed state-made laws. But if no sanctions snap at us, other folks may feel free to follow. If the state punishes people making positive changes, then the state risks being judged the villain. Months after I encountered the Common, I met Margot and Rainey. Again I was cycling, they were pruning, Rainey stepped street-side to chat. She offered to add my name to a list of garden enthusiasts. Later, she invited me (and others) to attend a garden (re)design party. Soon, I was working on the Common, under Margot and Rainey’s mentorship. That was early 2012. Since then, I’ve found enough confidence on the Common to become care-giver to the Annex, and co-founder to the Fair Field. A good idea done well can spread in many directions. It can move along a spectrum from “don’t you dare do it”, to a semi-tolerated exception to the rule, to just another way of doing things, to the new normal. Maybe, just maybe, a good idea can stiffen into brand new rules, brand new laws. The Haultain Common is not just a garden. It is a story of specific people with specific passions and reasons, touting or testing specific rules, jostling for our collective allegiance. The Common is a story of harmony, and struggle. To paraphrase some paragraphs in my thesis: Socially-and-ecologically constructive social norms, if clearly communicated and persuasively defended, if unmet by any serious sanctions, if applied within our own close-knit social circles (which overlap with other social circles, and so on), and if introduced in contexts likely to be judged appropriate by bystanders, if if if, then those social norms stand a chance of evolving into transformative tools for social-ecological change. Rule (re)making cannot be presumed, but it can be pursued. Can enough of us join a rule r-evolution? Can we steer our culture toward a greener future, or will we be over-ruled?